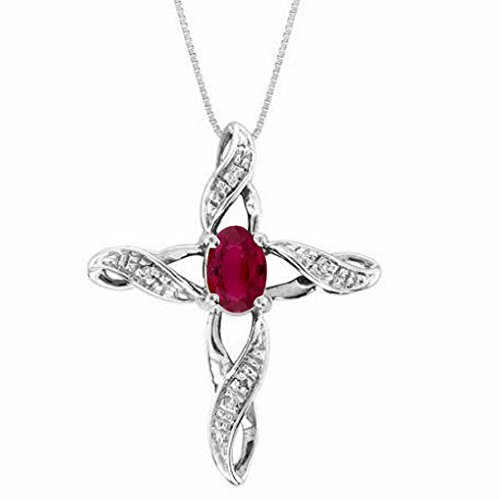 Stunning Sacred Crucifix Necklace set in Sterling Silver with Genuine Diamonds and Natural Ruby (July Birthstone). Don't hesitate to message us with any questions. :) * Will be shipped in elegant gift box with 18" Chain. * The natural properties and composition of gemstones define the unique beauty of each piece. The image may show slight differences to the actual stone in color and texture. Color Stones may have been treated. * Please see our other listings or contact us for more information. Will be shipped in elegant gift box. All our diamond suppliers certify that to their best knowledge their diamonds are not conflict diamonds. The total diamond carat weight listed is approximate. Variances may be up to .05 carats. Single Cut diamonds -Some Diamonds May Consist of Fewer Than 17 Facets. Total Metal Gram Weight posted is approximate. It is the approximate finished Item Weight including stones. The natural properties and composition of gemstones define the unique beauty of each piece. The image may show slight differences to the actual stone in color and texture. Color Stones may have been treated or simulated. The total Color Stone Weight is approximate. Variances may be up to 10%. If you have any questions about this product by Rylos, contact us by completing and submitting the form below. If you are looking for a specif part number, please include it with your message.